Steel Toe Boots from Red Wing Richmond are all about enduring and total protection for your toes. All of our boots offer great protection and are built to last. However, it is our steel toe boots that we recommend for jobs that place your feet in danger. More than once, we’ve had customer come in to the store and shake our hands because the boots we sold them kept them in the “10-toe” club after an accident at the work site. Accidents happen, but with Red Wing steel toe boots, you can rest assured that your feet will be protected from them. Red Wing steel toes are designed by our master cobblers with protection in mind. In fact, building the very best in ultra-protective boots was were Red Wing got our start. Charles Beckman, a cobbler in Red Wing, MN, went into business at the turn of the 19th century. He set out to create a boot to protect his friends that worked in the oil field and iron mines nearby. The rest, as they say, is history! Using time tested design principles and modern technology, we provide the best in protection through our legendary steel toe boots. That’s all great, but it’s not enough to make us happy. Before we bring one of our steel toe boots to market, we submit them to independent testing facilities. These testers rigorously test each and every pair, through an absolutely grueling battery of tests . The designs that don’t hold up never make it to the production line. If you’ve got a job that requires maximum protection, look no further than Red Wing Richmond. Get Ready To Work With New Steel Toe Boots! We welcome the opportunity to custom fit you in a brand new pair of steel toe boots! 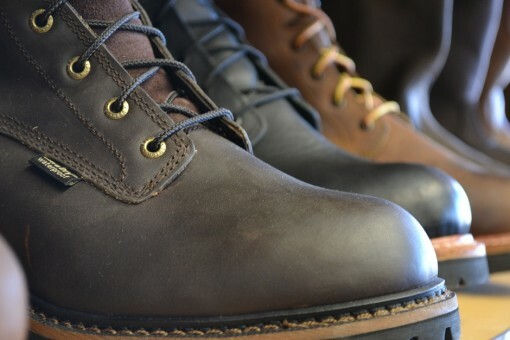 Just stop in to any of our Richmond area Red Wing Shoe stores, leave us a message on Facebook, contact Red Wing Richmond online, or just give us a call!